Meet Coco Vargas, the Field Marketing Manager at Chameleon Cold-Brew. Coco has been repping brands for the majority of her career, and she's been with Chameleon Cold-Brew from its inception as a start-up coffee brewery and brand. Q: What inspired you to start working in marketing? Did you have any role models or learn from someone, in particular? A: I had quite a bit of experience with brand ambassador work which led me to a full-time position with Chameleon Cold-Brew. I love meeting people and working events so this line of work couldn’t been a better fit. A: Don’t give up, keep exploring your interests and strengths. Ask questions and surround yourself with people you admire. Remember, nobody has a clue what the hell they’re doing. We are all trying to figure it out. Sit still and focus on what you want. In the end, it’s all about your happiness—nobody else’s. A: My boyfriend has taught me a bit of woodworking. My favorite project so far has been building a coffee table. A: Working for a start-up, I've learned so much at my job. When I first started this position, there wasn't a process for anything. Learning quickly to take chances and seek advice from people who have experience was fundamental. Also, remember to reflect on how much I've grown professionally is challenging. I tend to be my worst enemy. A: I have to exercise. Major stress reliever. Your favorite book: Lena Dunham’s book, "Not That Kind of Girl"
Your local Austin gem: BookPeople. I could spend all day there. 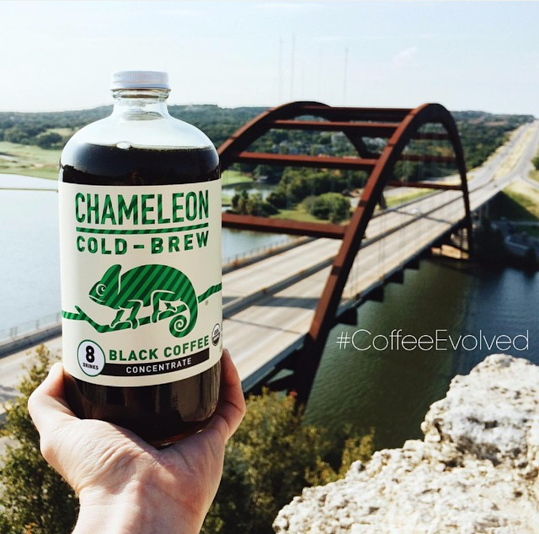 Your social media handles: Check out Chameleon Cold-Brew on Facebook or Instagram at @chameleoncoldbrew. Follow Coco personally on Instagram at @cocomariev.